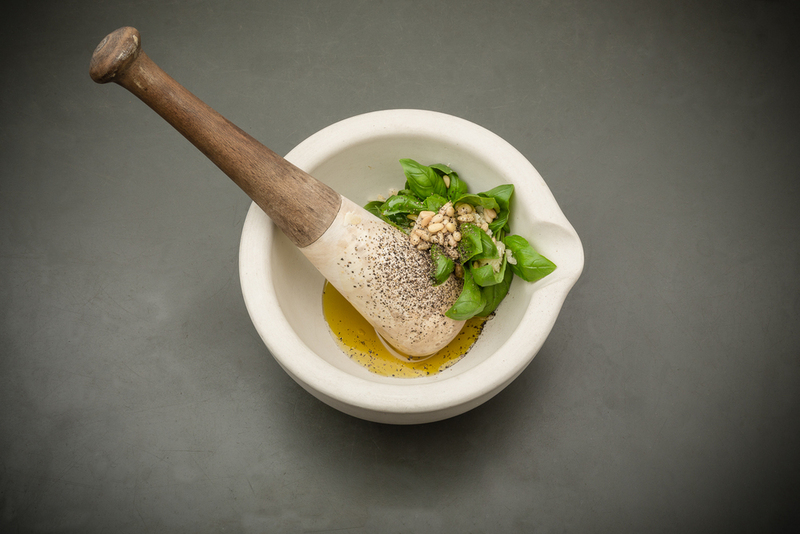 'Pesto' originates from the Genoese word pestâ (Italian: pestare) which means to pound and crush - in reference to the original method of preparation with marble mortar and wooden pestle. Save on your supermarket spend, as great tasting pesto sauce is extremely simple to prepare and following my recipe below will transform any humble bowl of pasta! 1) Take a small handful of pine nuts and put them in frying pan over a low heat and until they turn golden brown. Shake the pan a bit or they will burn. 2) Place a couple of fat cloves of garlic and a little rock salt into a mortar and pound them until creamy. Add the pine nuts and a generous handful of fresh basil, parmesan shavings and a good slug of olive oil. 3) Pound again until all the ingredients are bound together in a sauce. Season with coarsely ground black pepper and voilà - a scrumptious pesto sauce! Quick additional tip: often people take the easy option and just throw the ingredients into a food processor, but I think the resulting texture is too smooth and uniform. Add to pasta on its own or sauté chicken cubes and stir these in to the pan. Same goes for firm white fish or seafood like prawns, mussels or clams. A few flakes of chilli wouldn't go amiss either. Moussaka / Cookisto Goes Greek!